Steph Curry went from zero to Clark Griswold in about 3.5 seconds. Curry didn't play in the Warriors' 99-92 Christmas Day win over the Cavaliers, but he was at Oracle Arena supporting his teammates. Then, in some sort of apparent Christmas miracle, Curry zipped home, got into his jammy jams with his wife, two daughters and two dogs and posted an adorable Christmas selfie to his Instagram account. Steph and Ayesha's older daughter, Riley, already stole the hearts of NBA fans with her cameos in playoff press conferences, so it's probably not much of a surprise to see the Currys looking like the family whose photo comes with the picture frame. 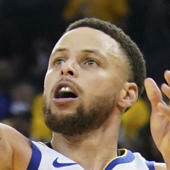 Curry has missed the Warriors' last nine games with a sprained right ankle, but the team has said that he's making good progress. He'll be re-evaluated this week, and will likely rejoin the Warriors in the near future. Meanwhile he can keep posting #familyholidaygoals photos on Instagram.